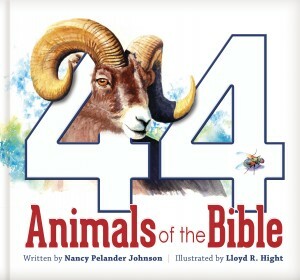 Nancy Pelander Johnson did a wonderful job in including the animals she did in 44 Animals of the Bible. From common to uniquely named creatures, the animals she included were all illustrated beautifully by Lloyd R. Hight and interesting to my children. The biblical references were also a wonderful addition as the King James Version (KJV) is always a great starting point in comparing scriptures as differing versions change vocabulary a bit. We like the KJV but always compare other versions in order for the children to understand and compare in terms that are more modern. Each animal description received full-page descriptions with details for each animal highlighted as well as the scripture reference for the child to read or turn to on their own. Together, a parent and child can take the animal explanations to another level by integrating current information on each animal and creating science and social studies lessons from each. Researching the globe to find the existing locations of our animals was a highlight of our looking through the pages and researching where they are currently found. This book has many issues to be discussed and investigated in reference to animals and their bible correlations and will not be a disappointment to a children’s book lover. To read more about this book click here. To see more books by New Leaf Publishing Group click here. Water and Weather is a concise thematic unit study supporting a biblical perspective. Tom De Rosa, a creationist and experienced science educator, along with Carolyn Reeves, also a science teacher with a doctorate in science education who is currently writing and providing educational consulting, did a wonderful job on this book’s content. It is written with both the teacher and student in mind. It has twenty investigation chapters along with a glossary of relevant terms. The home school parent and teacher will not find it difficult to organize the content as it is all written out on page five in How To Use This Book. Bloom’s taxonomy of teaching is definitely incorporated into throughout all lessons from defining to evaluating. Each investigation has the teacher engage the student in actively realizing the information for more than words on a page. In chapter one, students will design their own fossils after learning about how God created the dinosaurs and physically measuring them out on the floor to determine their size. Afterward, they will answer investigation questions to summarize the information. There are countless numbers of activities that can stem off of these investigations. The authors created some wonderful text and activities that will kick off a multiplicity of ideas to discover. This book has more than the typical water cycle and weather content. I am impressed with the range of content and vivid pictures as well. 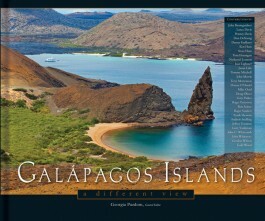 The book is inexpensive and can be purchased with a matching journal and teachers guide each only for $4.99. You will be pleased with this book. This book was sent to me by New Leaf Publishing in exchange for a book review. All opinions expressed are my own. A book for all ages, I found this book to be very pleasing. All the pages were thoroughly yet succinctly written by many special contributors. Great names like John C. Whitmore, Todd Charles Wood, Nathaniel Jeanson and many more used profound expertise to share their information in a way that readers may admire God’s creation. The inclusion of material in this text which these biochemists, ecologists, and geologists present brings scriptures to life. This, along with in-depth information about Darwin’s discoveries and how they compare and relate to God’s word are captivating to say the least. The vibrant pictures of wild life in their natural habitats captured the attention of my second grader while the text just added to the amazing pictures for my teens. Another wonderful thing I like about this type of non-fiction book is the wealth of information located in the back of the book. The ability to learn about and be introduced to like-minded individuals, as these scientist and authors, is priceless for anyone who is seeking out more resources in learning about science and God’s creation. The ending includes references, articles, DVDs and websites used within the writings which students can use for more research. You will also find a very inviting presentation encouraging you to look up the book Grand Canyon by Master Books, which seems just as appealing as Galápagos Islands. Definitely a must have for your library. See the book here on the New Leaf Publishing Master Books webpage. This book is published by Master Books, a division of New Leaf Publishing Group. It feels awkward to review a bible. Of course, it’s going to be amazing! I am going to focus my review on the supplemental devotions within the text. The first thing that tantalized me about this bible book was the cover. It’s just cute. A home school mom is usually into creativity because they work from home making our children’s education as interesting as possible. The devotions that Janet Tatman wrote throughout this King James Version Bible are wonderful. I was already following the Daily Focus devotional from Alpha Omega Publications but I was pleasantly surprise when I found out that she put her devotional writings into this bible as well. I was a bit disappointed when I opened it and there was not a bit of color on any of the pages. The front cover sets you up for wanting more of scrapbook type looking pages on the inside but after overcoming the initial black and white disappointment, I realize the text itself was probably going to be colored up by my highlighters anyway. I am enjoying this bible and am glad I received it. This book carries wonderful insight about the way boys think. As a mother of three girls and only one boy I never realized how different I needed to raise him. Being fair amongst my choices in raising him, I know now does not mean being equal among them all. According to Gregory L. Jantz PhD and Michael Gurian he needs a whole different type of upbringing than the way I raise my girls. I am seriously glad I received the insight because I did not know until I read this book the reason my son could not handle more than one task at a time or why when he was upset he would rather go to his room and think it out alone instead of working it out with someone. Some of the great features about Raising Boys By Design are that the text contains a timeline for boys from birth to adulthood and their use of technology with do’s and don’ts for each age group, it contains advice about creating technology free rooms, Internet filters and cell phone use. All of the previous prefaced by the effects that “time on the screen” have on his developing brain. The amount of information on developing boys is so immense that I felt there is too much to grasp in one sitting. Using this book as a reference and revisiting the information is helpful and will be a good idea in taking the information as needed after reading all the way through to get the basics. One particular favorite part of mine was “8 ways to help boys processing emotions.” It went through different tactics to help your boy express themselves safely in physical and verbal ways. It made a big difference to approach my son in such different ways that appeal to his thought process. We knew what we wanted to have as an end result for his character development and moral standing; therefore this book came in very handy for imparting it in a way to make a better connection with him. I received this book for free from WaterBrook Multnomah Publishing Group for this unbiased review.